Did you know you can fundraise for B'nai Jacob, without doing anything more than shopping? It’s simple with B'nai Jacob’s Scrip Program! Scrip fundraising is a no-selling program that allows families the power to fundraise throughout the year, without doing anything more than purchasing gift cards in place of cash, checks, and credit cards. Scrip shines when families use it for as much of their shopping as they can, with over 700 retailers available on www.shopwithscrip.com, we’re sure you will find all of your favorite stores. We offer gift cards for gas, groceries, clothing stores, restaurants, home improvement, entertainment… the list goes on. By regularly using the scrip program, a single family can easily earn $600-$1000 or more in just one year. Who doesn't love receiving a gift card to their favorite stores? Take the stress out of searching for that special gift by purchasing gift cards for all of the special people in your life! 1. Order ahead for the month. 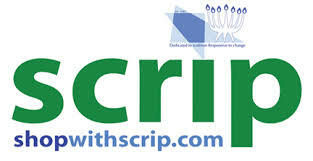 Pay BJ and place your order online at www.shopwithscrip.com, or set up an automatic order with your credit card on file or make B’nai Jacob a payee and have your bank send a check every month. 3. Buy from inventory in the office or at board meetings. 4. Call/text Judy at 203-980-5607 with your order and then pay as above. 2. Reloadable plastic cards that can be registered on the scrip website and then reloaded. Use the same procedure as above. As soon as payment is made, Judy releases the order and reload is by the next business day. You can register someone else’s card and reload it for them. (Give your kids Uber, Starbucks, Whole Foods, Barnes & Noble, etc). 3. Purchase downloadable scrip that you can print on your computer. Same process as reload-order and once payment is received, Judy releases the order and download is within minutes. 4. Purchase downloadable scrip and access through www.myscripwallet.com. This way you can access the scrip on your phone or iPad and anyone in your family can access it as well with your log in information; so, it’s with you when you shop. This works with all “scripnow” purchases. 5. Send an e-gift to someone. How much will BJ earn? There is something on the attached list for everyone. (The list omitted Home Depot but they are definitely available). Grocers, pharmacies, fast food, gas, department stores, specialty stores, restaurants, airlines, hotels, cruises, etc. It won’t be difficult to spend $100 per week! We do accept credit cards because we want you to use the program. Just deduct 2-2.5% from the rebate offerings if you use a credit card. Any questions, please contact Judy Taylor. She is happy to give you a tutorial so we can find the easiest way for you to make scrip part of your routine. It will make a huge difference if we all participate. You do have to pay ahead for whatever you purchase (unless it’s from inventory, then you pay at the time of purchase) because BJ doesn’t have enough money lay out the money and collect when you pick up your cards. Please check out Amazon Smile next time you’re shopping on Amazon. It pays organizations a small percentage rebate for every purchase made on Amazon.com. This is not linked to Scrip, so you should always buy on Amazon Smile no matter how you are paying. When you log on you can click on Amazon Smile and link it to B’nai Jacob. Then save the icon. If you click on that icon to enter Amazon every time you go to Amazon.com, the rest happens automatically. You won’t notice anything is different but you’ll be earning rebates for BJ. IT’S A MITZVAH TO SHOP!!! The Gift Shoppe is always open by appointment!! Please call the synagogue office at 203-389-2111.